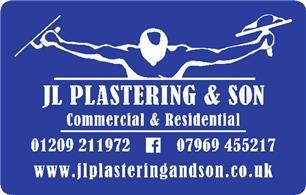 JL Plastering and Son Ltd - Damp Proofer, Plasterer based in Redruth, Cornwall. We are a reliable, family run company with our experienced plasterers, highly skilled to an exceptional standard . Here at JL Plastering & Son our plasterers are highly experienced in all aspects of domestic, commercial and industrial plastering. Our professionalism is second to none. Through every step of the way from receiving your free estimate to your final hand shake at the end of the job here at JL Plastering & Son your satisfaction is our number one priority. All of Cornwall //Penzance/Redruth/ st Austell/ Helston/ Falmouth /Truro/st lves/ Newquay/Hayle/and many more ! !